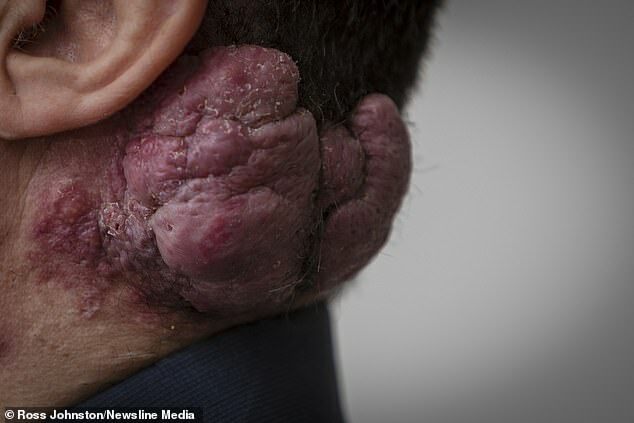 A former oil worker has waited six years for surgery to remove a ‘hideous’ growth on his neck, costing him his job and girlfriend. 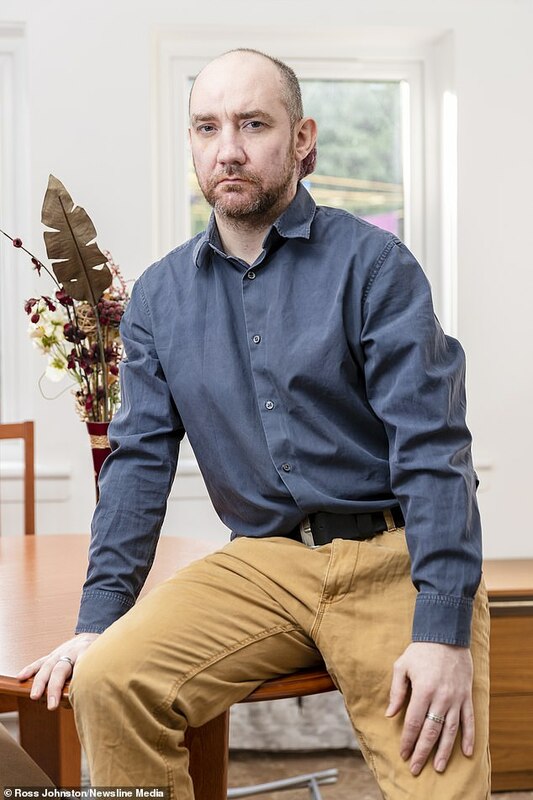 Don Wright, 40, from Bridge of Don, Aberdeen, saw his GP in 2013 when he found a small growth where a birthmark had once been. Despite being referred to a plastic surgeon, he is still waiting to have the removal of the lump which has a foul smell and often leaks. With his mental health deteriorating, he was sacked from his job because he was unable to concentrate properly. 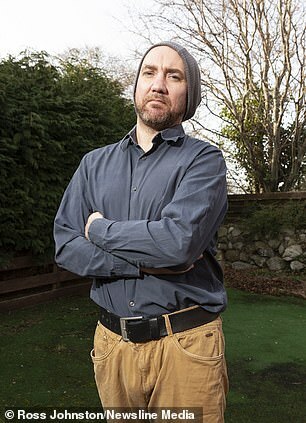 He has been unable to get employment since, due to always wearing a woolly hat to cover the growth, which is now the size of a grapefruit. Mr Wright said: ‘Please hurry up. I just want this nightmare over. 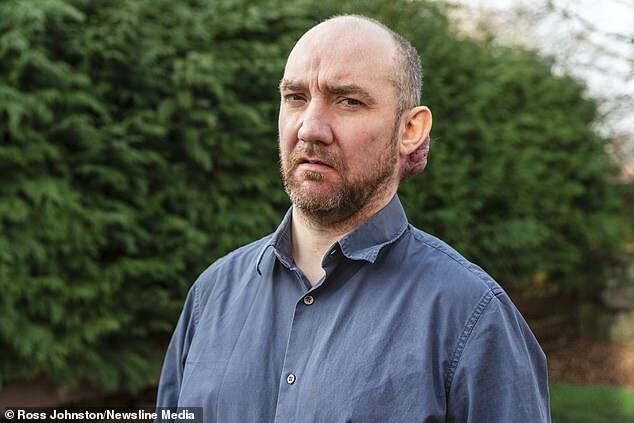 The medical name for Mr Wright’s growth is called a haemangioma, which consists of an abnormally dense group of extra blood vessels. Normally the growth appears as a child – about one in every ten babies has a haemangioma and they are most common in girls and premature babies – and reduces in size over time. But Mr Wright’s continues to grow, causing him to have neck spasms, and pain described as hot needles. 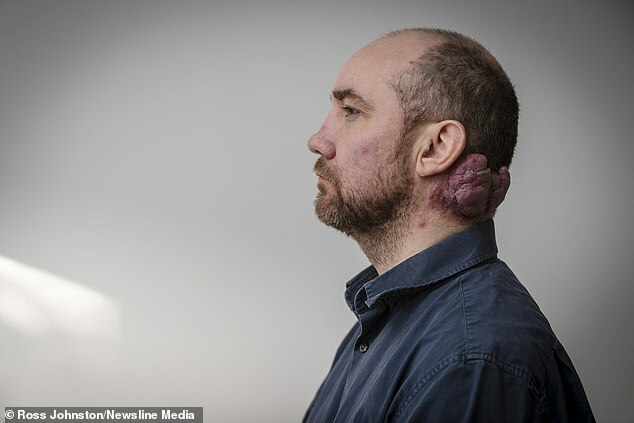 According to the Daily Record, Mr Wright revealed he was born with a strawberry birthmark on his neck. About 19 years ago, he had it lasered off but the treatment only removed some of the redness. 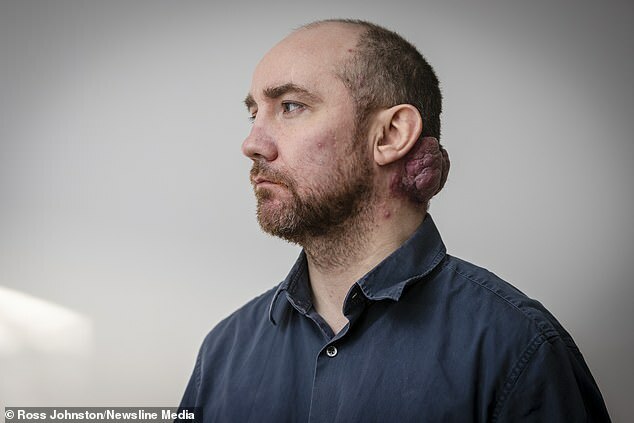 In 2012, he noticed there was a growth on the site of the birthmark which only became bigger as he monitored it. He was referred to a plastic surgeon at Aberdeen Royal Infirmary but he didn’t see them until 2015. 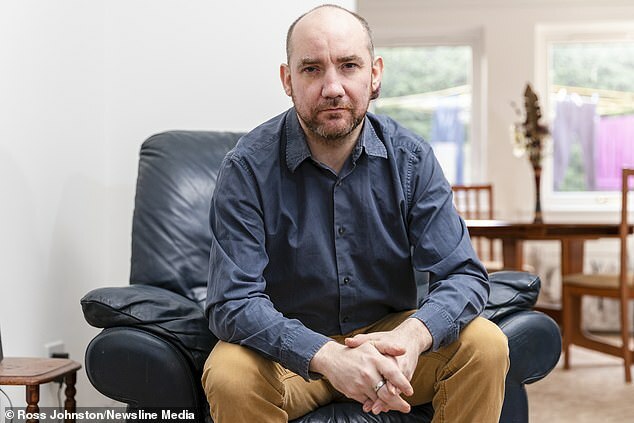 He repeatedly returned to his GP who told him there had been a mix-up with funding as they had hoped to send him to Glasgow for treatment – which was refused. 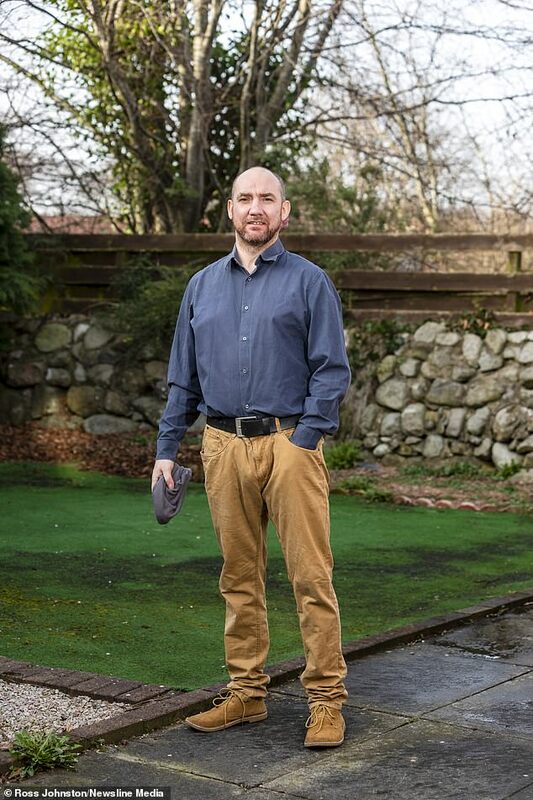 In 2016, Mr Wright had an embolisation, a procedure to block a blood vessel to stop bleeding or to block the flow of blood to an abnormal area of tissue. This was done to reduce the loss of blood when the growth was removed later – which never happened. He had another embolisation carried out in November 2017, but again, did not have the removal of the growth. The Scottish Government guarantees a patient should have their first outpatient appointment within 12 weeks of being referred by their GP and receive the decided treatment within 12 weeks. Mr Wright received a letter of apology in September saying that he would be offered a date for surgery as soon as possible. However, five months later, he is still waiting. 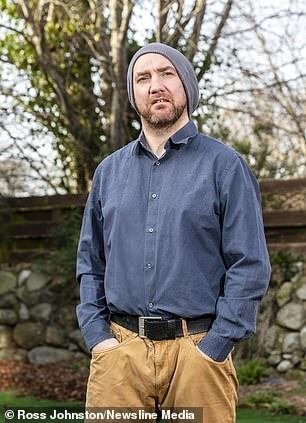 Mr Wright, who is an electronic technician, lost his job when he made a mistake booking a holiday – an error he said occurred due to his drop in mood and focus. At the same time he lost his job, he and his girlfriend of two years broke up because she said he ‘wasn’t the same person anymore’. An NHS Grampian spokeswoman said: ‘We are sorry to hear about Mr Wright’s experience. It has clearly been a very frustrating time for him. A haemangioma is the most common type of birthmark. It is a benign tumour of the cells which normally line the blood vessels. In these birthmarks, the cells multiply more rapidly than normal causing a collection of small blood vessels that form lumps in, or under, the skin. About one in every ten babies has a haemangioma and they are most common in girls and premature babies. They usually appear when the baby is about two-weeks-old and about 60 per cent develop on the head or neck. Most do not require any treatment but those near the eye, on the lips, or obstructing the airway will. Treatment options include pain relief, beta blockers, laser treatment, steroids and surgery. Freya-Esmae was prescribed the beta blocker propranolol, which works by blocking the release of noradrenaline in certain parts of the body. Noradrenaline is a chemical released by nerves when they are stimulated. The noradrenaline passes messages to other parts of the body, such as the muscles, blood vessels and heart. It is thought that propranolol helps narrow the blood vessels, reducing the amount of blood running through them. This reduces their colour and makes them softer. As a result, birthmarks which are made up of a collection of blood vessels become less pronounced. The cells that cause the growth of the haemangioma are also affected so the haemangioma gets smaller.